It is amazing how attached we get to stuff. It seems the longer we hold onto things, the harder it is to get rid of. Do we feel like we are invalidating the person we once were if we declutter? I say “we” because I know that I’m not the only one who holds onto sentimental clutter. The past few days, as I have been purging, I’ve been keeping in the back of my mind the idea “less is more”. And it really is. I have thousands of music files on my computer but in reality there are only a couple dozen I listen to. When I have too much, it’s harder to focus on those things that I enjoy the most. Here is my answer. In my 10th grade year of high school, I joined the track team. I wasn’t very good at the time but my legs got really strong from doing my paper route every morning and I started to enjoy running so I figured why not. I went from 10th grade where I had the nick name Thumper, because my form was so bad you could hear me coming, to my 12th grade year where I ran hurdles and earned the coaches award. I was proud of that time of my life. I had a goal to get better and I didn’t quit. The lessons I learned has carried over to my adult life. When I looked at that jacket, to me it represented that time of my life. The idea of getting rid of that felt like I would lose those wonderful memories with it. The thing is is that I don’t need that jacket to remember those times. 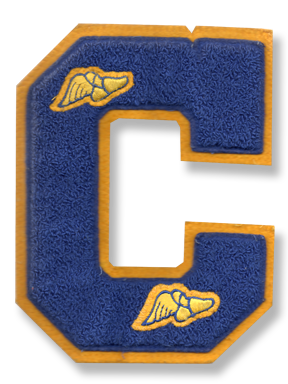 I don’t need to hold onto a jacket that I once wore with pride at Clovis High. Those memories will live with me for many years to come even without it. I didn’t completely get rid of it. I kept the letter. Someday soon I am going to make a display with my coaches award and the letter. Do I need to keep those too, no, but it will be fun to display. If anyone asks about it I can tell the stories of that special time in my life… about a time when I had a goal and I accomplished it.